Federal Budget 2019- What’s changed? March 27, 2019. Our office has received a ton of questions about the March Federal Budget Announcement for Grande Prairie. This included incentitives planned for first-time hombuyers. The only immediate change, is that first time buyers can use up to $35,000 in RRSP money for down payment, up from the previous $25,000 allowed. You will still need to re-invest this into an RRSP within a 15 year time frame. If you take out $35,00 that means you should put at least $2,333 back into your RRSP each year. Should you forget to return money to your RRSP, the goverment will have you pay tax for each forgotten portion. The second announcement by our federal government introduced the First-Time Home Buyer Incentive. The Canada Mortgage and Housing Corporation will provide first-time buyers up to 10% of the purchase price of a new construction home. They will also give 5% of the purchase price for a resale. There’s no clear plan for how you the borrower will be required to pay for the loan. This leaves many questions unanswered, and makes it impossible to predict the benefits of this incentive. It remains very unclear if the government will take an equity position in your home or if you would have an interest-free loan. For borrowers, understanding how this loan is required to be repaid is important. If the government is taking an equity stake in your home, the amount that you the homeowner would have to repay will grow as the value of your home increases. In this case, I question if this is a good thing for borrowers at all? Potentially you are giving up a lot of your equity at sale time. This week our 1 year mortgage rate, 2 year mortgage rate and 5 year mortgage rate all dropped here in Grande Prairie. 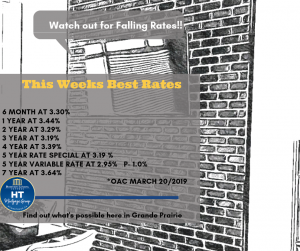 Watch out for those falling rates!This week we are excited to share that rates are falling! Our 1 year, 2 year and 5 year rates have all dropped! At this time only purchase price’s below $400,000 will qualify. These will further limit how useful this program is for you! As we are made aware of updates to this announcement, we’ll let you know! 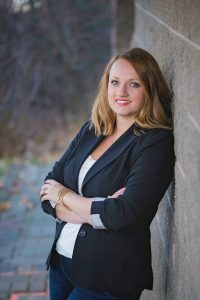 Megan Lemay, managing Broker at HT Mortgage Group has had many clients contaact her with questions since the federal govement announced the 2019 Federal Budget! We got on June’s Top Performer List! Out of more than 190 Dominion Franchise’s in Canada, this month our office HT Mortgage Group here in Grande Prairie ranked #18! We are at the top! What is the top performer’s list? That’s when Dominion Lending Canada looks at all of its mortgage brokers all across Canada, and to let us know which agents and mortgage brokerages perform the best! Being able to be on this list when we live up North here in Grande Prairie is a huge honour! DOMINION LENDING CENTRES CONTINUES TO ATTRACT CANADA’S BEST. GROWING MORE THAN 2,600 EXPERIENCEDMEMBERS IN JUST 11 YEARS! Out of more than 190 franchise’s in Canada we are #18! Out of more than 2600 agents, we have two in the top 50! 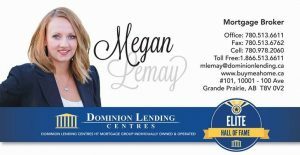 This week Megan Lemay is our Grande Prairie Mortgage Broker of the week. 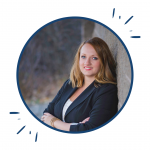 For over 11 years Megan has been a core part of our team at Dominion Lending of Grande Prairie. Megan and her husband Chris live out in DeBolt, with their 1-year-old son, Cullen. Megan and Chris are self-employed so their days are busy! In Megan’s spare time, she loves the outdoors and spending time with her tight-knit family. Give her a call today and to shop local and national lenders for the best rate and mortgage for your home.